One of the most valuable assets of animal massage is health maintenance. Regular massage aids in early detection of abnormalities, such as swelling, injury or painful areas, and facilitates early medical diagnosis of problems. In some cases the time element can be life-saving. The animal’s general overall health is boosted by an increase in blood and lymph circulation and enhancement of muscle tone and flexibility. *Fox describes touch as “a potent bridge for love,” thus regular massage develops or can further seal the bond between pet and guardian. 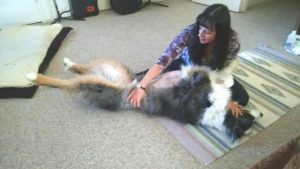 Many animals with emotional issues (depression, grief, shyness or distrust) respond well to the relaxation and positive touch of massage. Young animals can be acclimated to touch with massage, making them easier to handle for grooming and medical care.